Mitsumi Internal 3.5" Floppy Drive. The Original. Note: You are buying one not two. Mitsumi External USB CD R/RW Drive. NOT TESTED, Sold As Is, No cords available. Mitsumi CRMC-FX240S 24X Internal IDE CD-ROM Drive. Model: SR244W1. Get images that. Item specifications . Good working Newtronics Mitsumi D359M3 Floppy Drive. Standard 40 pin IDE interface connector. Ready to be put back to work! What you get. Mitsumi CRMC-FX410A IDE CD-Rom Drive. MITSUMI CRMC-FX320M2 CD-ROM DRIVE IDE INTERFACE BEIGEFACE. Mitsumi Bezeless No Eject Button 34pin Black Door. Part Number176137-M33. SPECIFICATIONS/FEATURES (Mitsumi CR 4804TE - CD-RW drive - IDE). Model 4804TE. HP CD-Writer Plus MITSUMI CR-4804TE MultiRead 24X 4X 4X INTERNAL IDE CD-RW DRIVE,Mitsumi cd-r/rw Drive, MITSUMI CD-RW DRIVE, CR-4804TE. Vintage Mitsumi CD Rom Drive White. Condition is Used. Not tested. Shipped with USPS Parcel Select once payment is received. The drive was pulled from a working machine and appears to be in great condition. The photos show the exact drive you will receive. Mitsumi CRMC-FX810T4 8X IDE CD-ROM Drive. Unit is tested and sold as is.Sold as is. Mitsumi CRMC-FX4820T 48X IDE CD-ROM Drive. HP CD-Writer Plus MITSUMI 2871664 8x4x32x INTERNAL IDE CD-R/RW DRIVE. HP CD-Writer Plus MITSUMI 2871664 8x4x32x INTERNAL IDE CD-R/RW DRIVE. Condition is New. Shipped with USPS Priority Mail. ** Please Note ** Read the exact product description from the pictures attached to this posting. I couldn’t find this exact model to copy this posting from so some of the listing information may not be accurate. This is a Nice New drive I just want you to be sure it’s the one you want. Also the disc specified on the package is missing. We looked through everything and are not able to locate it. Drive can still be installed without it. If you need any more information, product description or pictures please message us as we are happy to help. Thank you. This is a tested working, used, clean, Mitsumi 54x/32x/54x CD-RW IDE Optical Drive. Mitsumi Model #:CR-485GTE. Study Tools for Educators. Principles of Learning. -Institute for Learning-. A PowerMac G3 (or higher) Macintosh computer. (2003 University of Pittsburgh). A Pentium-based PC or compatible computer. 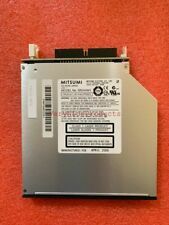 Mitsumi CRMC-FX4821T 48X IDE CD Rom Drive. Mitsumi CRMC-FX4830T 48X IDE CD-ROM Drive. BLOW OUT SALE! High quality products at great prices with exceptional service. The York Scientific way. Item # SH496. In running condition.